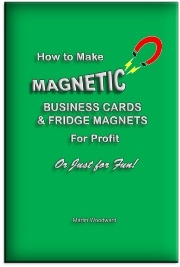 Superb eBook (or paperback) showing all the information you need to start your own magnetic business card / fridge magnet business from home with less than £50.00 capital. This can be run as a stand alone business or as an add on to another related business. Or make your own for your existing business and save money as well as having complete control of your artwork etc. This is very easy and enjoyable computer based work, ideal for any age, part or full time and easily operable from any home (requiring very little space). Please note this is NOT the acrylic ‘snap together’ type fridge magnets that cost about 25p each for the blanks (although details of these are also included in the guide). This is a unique method that enables you to produce quality magnetic business cards / fridge magnets for about 7p each (or less). These can personalised for businesses and sold in quantities, or sold individually as novelties at car boots etc, or made as individual gifts (additions to birthday cards?). Now also available on Amazon Kindle and iPad.